October 23, 2018. Once a year the Lone Star Flute Circle (Native American flutes) meets at Austin’s premier garden (and more) center – The Natural Gardener. Unique flute voices float out from the porch of the main building, hovering over ever-changing seasonal plants and yard sculptures. Husband Gary stays on the porch, taking turns with the others, contributing several of his flute voices. I wander the grounds, returning intermittently to the porch, listening to flutes all the while. Except – as I approached the labyrinth in the back corner of the property, flutes were overridden by a raven calling, calling, calling. 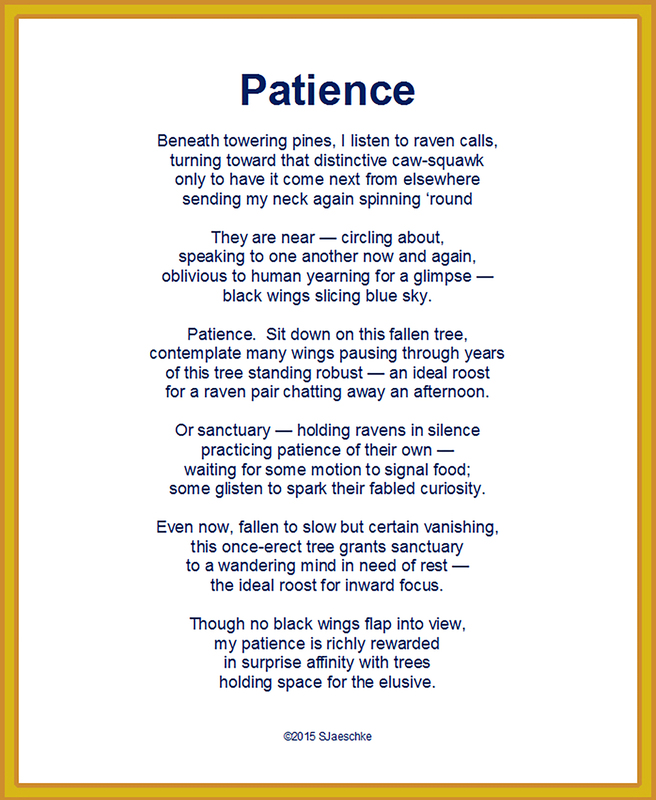 The stark shift in tone from flute to caw jogged my thoughts back to words read earlier – glass half full – calling as insistently as the raven – commencing a labyrinth walk focused on capacity to add more to my glass. This began with breaking open during Jimmy LaFave’s final performance three days before his death – witnessing his choice to live his last year on his own terms, embracing life rather than fighting death. The wrap-up arrived as a scientific article on lichens. Collage: Raven from Bryce Canyon, UT. Lichen from Red Corral Ranch, TX. September 17, 2015. 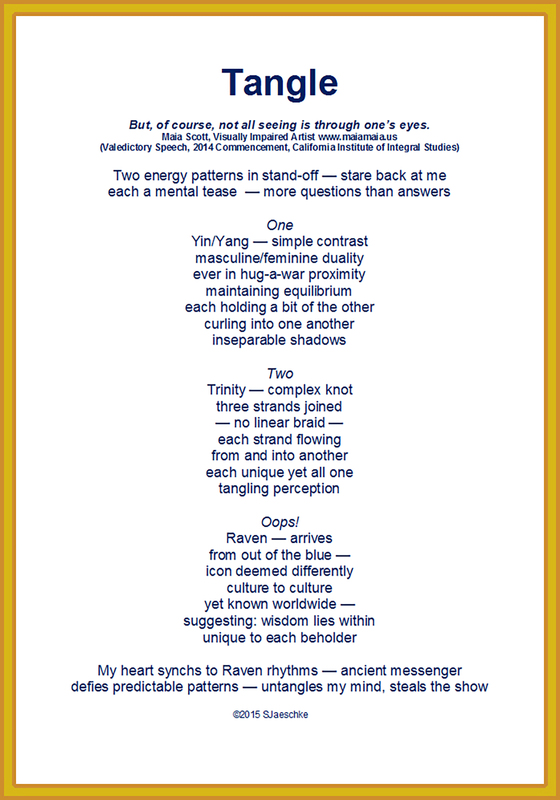 I have been entranced recently with visual symbols of energy flow – specifically looking at an old favorite, Yin/Yang, and pondering how that and the Trinity Knot might relate. I turned to collaging to give my left brain a break. As often happens working with imagery, a surprise “flew in” and rearranged everything. The image below is created with modified found art. 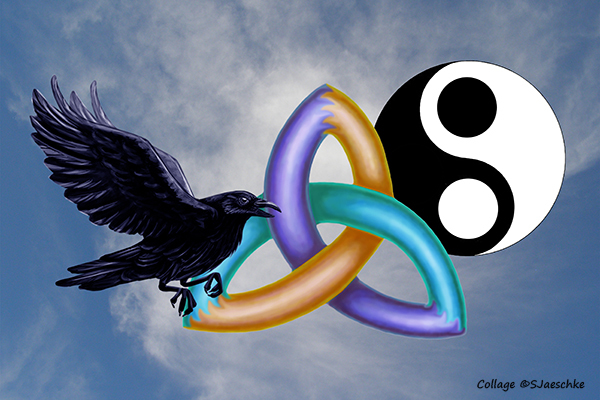 I am grateful to whoever created the raven image so perfectly reflecting what my inner eye observed. Symbols span a sky I photographed at The White Shaman Preserve – sacred space frequently visited, on the lower Pecos River near Comsock,Texas. Why get tangled up in symbols? I’m taking a class that called for a reflection paper on Trinity. I don’t really have much affinity with Trinity. I was stumped. 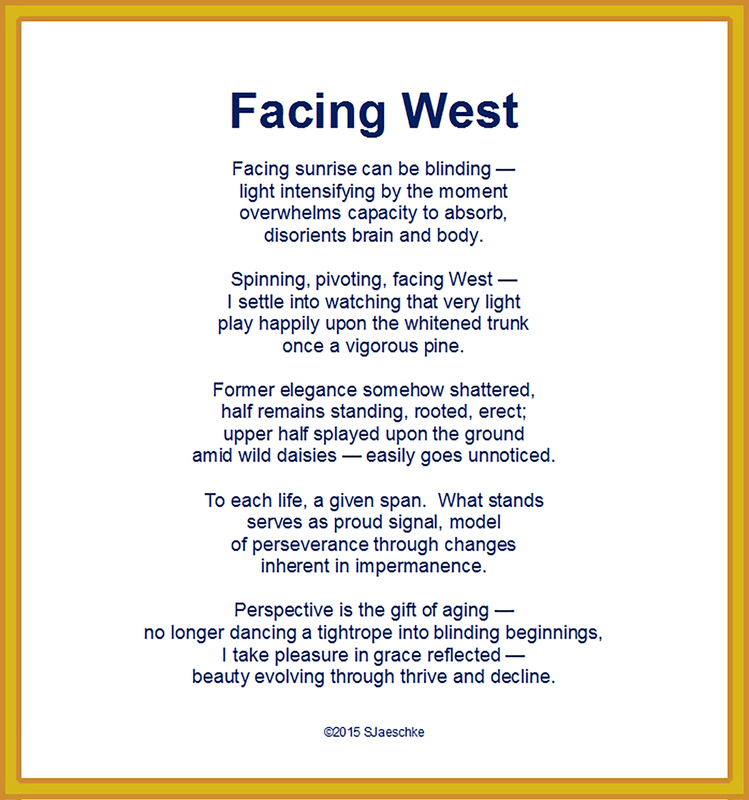 In the process of wrestling with unknowns, I stumbled on a delightful video of Maia Scott talking about how we “see”. I know Maia from several years of The Labyrinth Society annual gatherings, where she is a striking presence with her guide dog – not only walking labyrinths with limited vision, but creating them for others to walk! Listening to Maia, I concluded in this case, I’d be ahead “seeing” Trinity visually (through imagery) in lieu of wordy (doctrinal) concepts. August 17, 2015. I am home again from travels that took me away from the daily humming norm of to-dos. Time at 9000 feet elevation (think cool) dry-camping (think frugal water use) surely shifts one’s focus. Up above Cloudcroft NM there is no hurry. 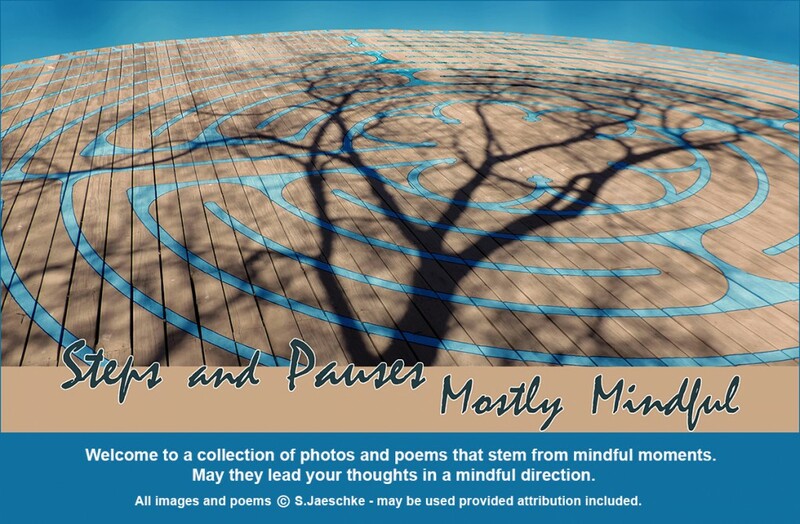 Time to sit, reflect … write a couple of poems! 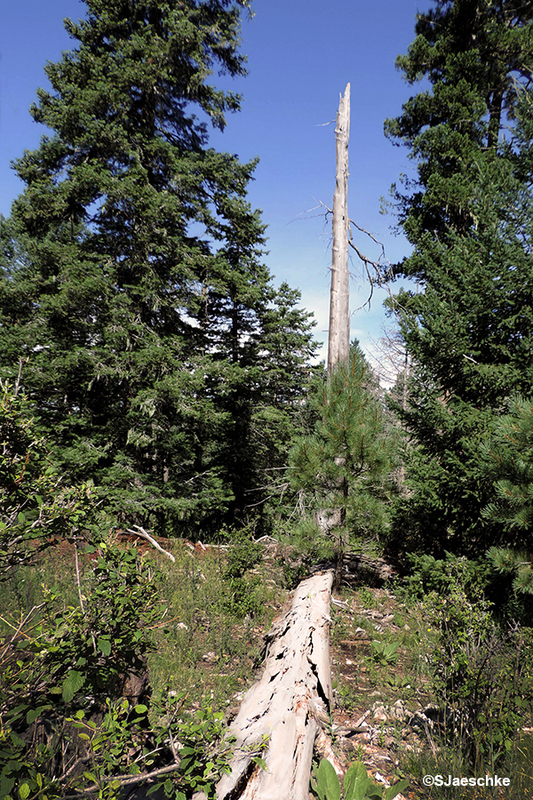 I’m including two poems in this post – both written in the presence of the pictured remains of a pine. The term for a fractured tree of this sort is “snag”. This one certainly snagged my attention. I found it while wandering on day two, and it became my little sanctuary for daily journal sitting.